@Bert Vanderveen , from a fact I know they are, you could/should have asked for an orthopidic surgeon. Hopefully there won’t be a next time, but just in case there is know that you are intitled to ask for a specialist. 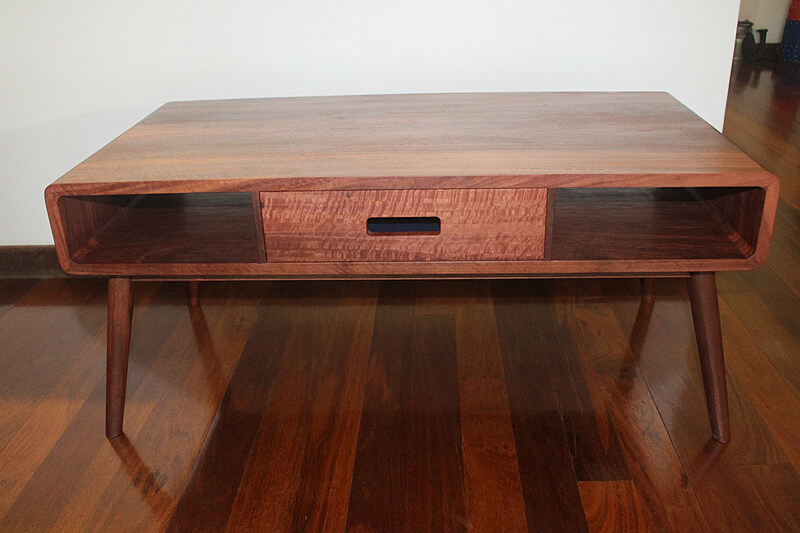 Before the coffee table was assembled from the parts, I was mindful that it would be shipped from Perth to Sydney (which is the further than New York to LA). 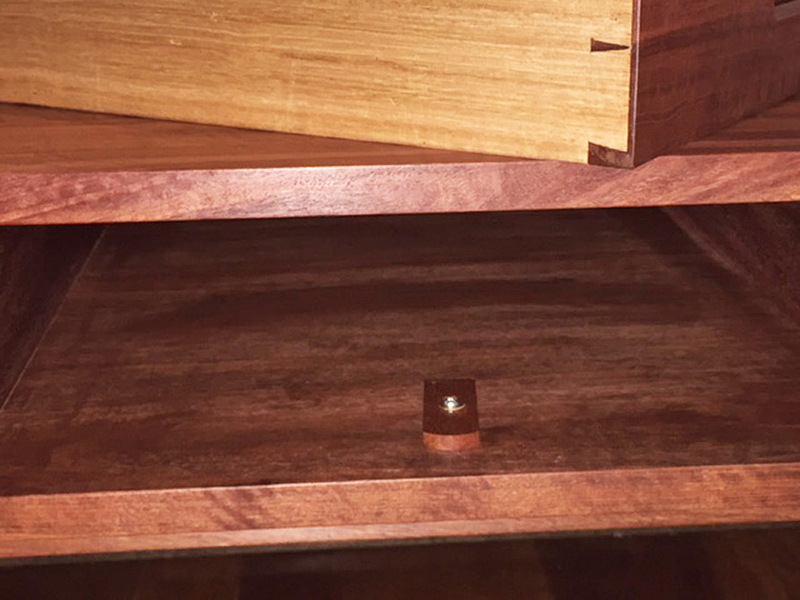 The main concern was that the container might bounce (be dropped or be handled roughly), and the weight of the heavy Jarrah top coming down on the splayed legs might cause them severe damage. (I am not concerned about the strength of the legs for normal home use - the construction is strong. More shortly). 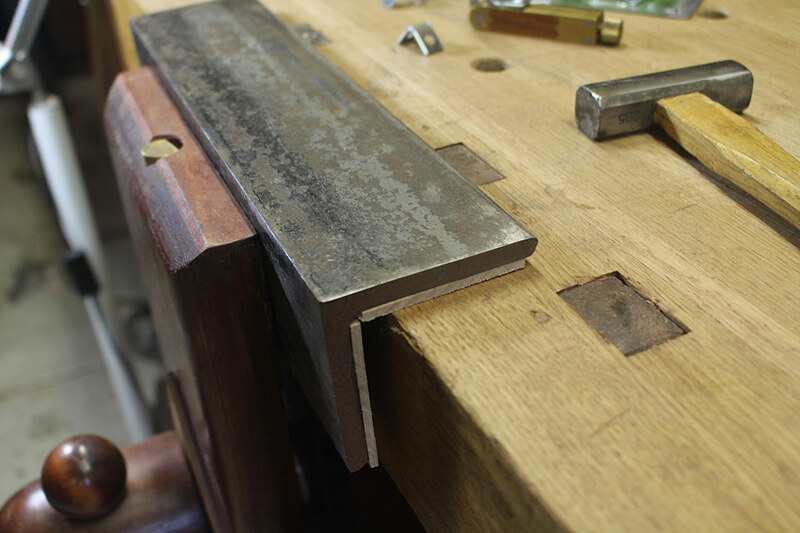 Part of the strength in the splayed legs comes from the corner brackets, which act to lock in the mortice-and-tenon joint by preventing movement. These steel angle brackets further lock in the base from any possible twisting. 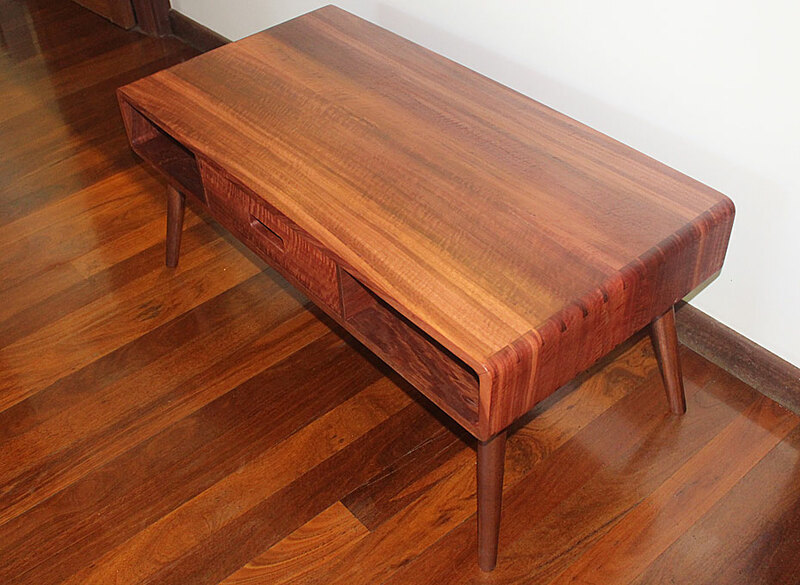 The finish for the wood - Fiddleback Jarrah for the top of the carcase and the drawer fronts, and Jarrah for the base of the carcase and base/legs - was chosen for durability. 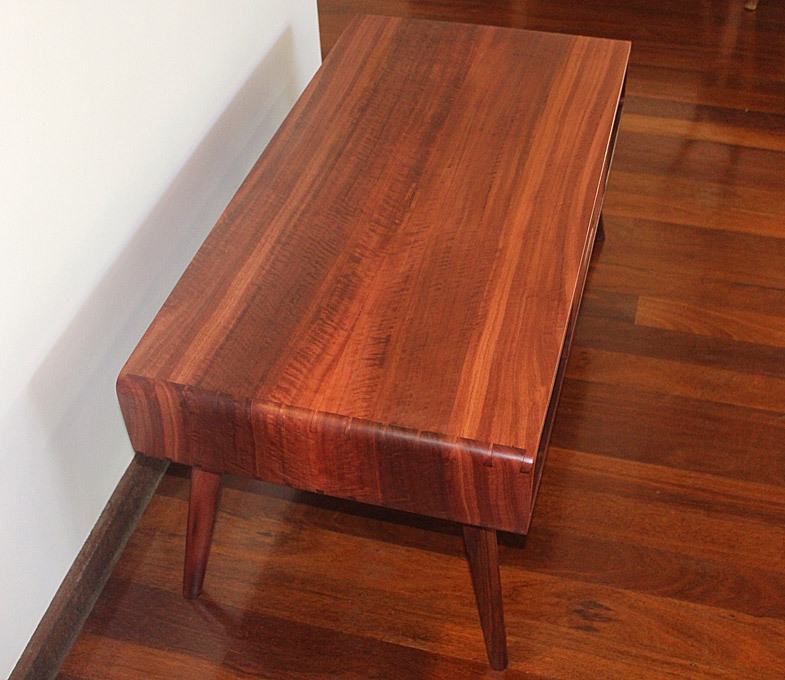 It needs to be capable of resisting water marks and heat, and still have a natural appearance - not a sit-on-top finish, such as a poly or varnish. 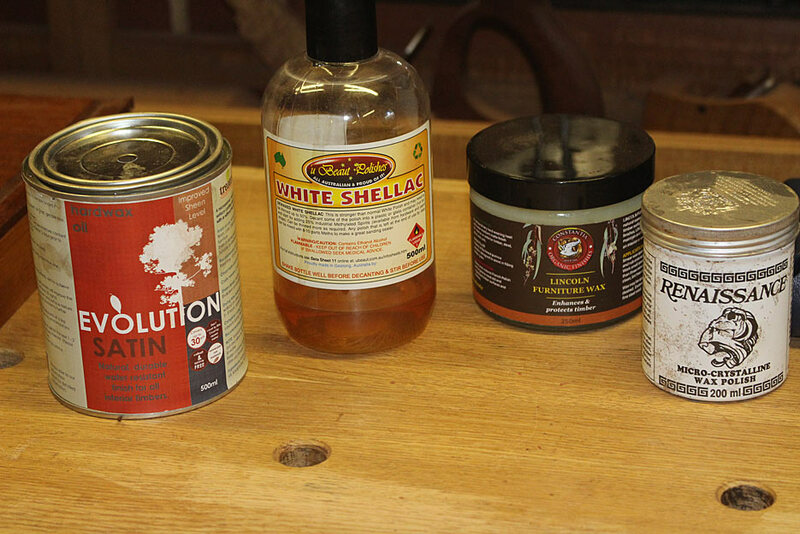 Most oil finishes are not durable enough. 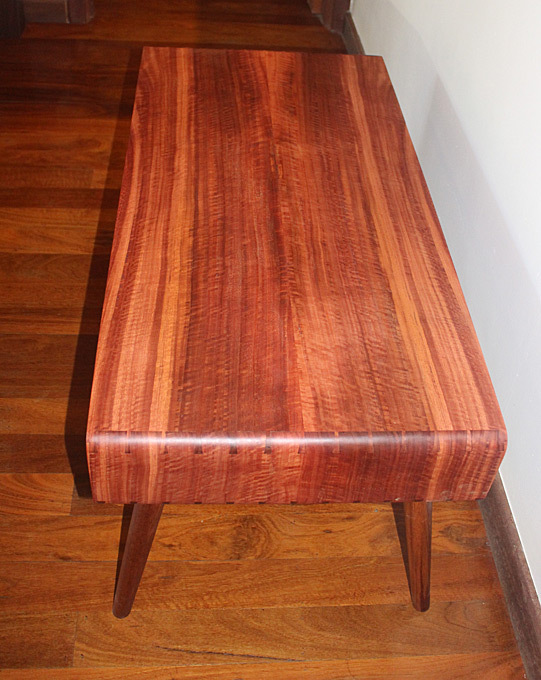 What I went with in the end was Evolution (satin), a hard wax oil by Whittle. 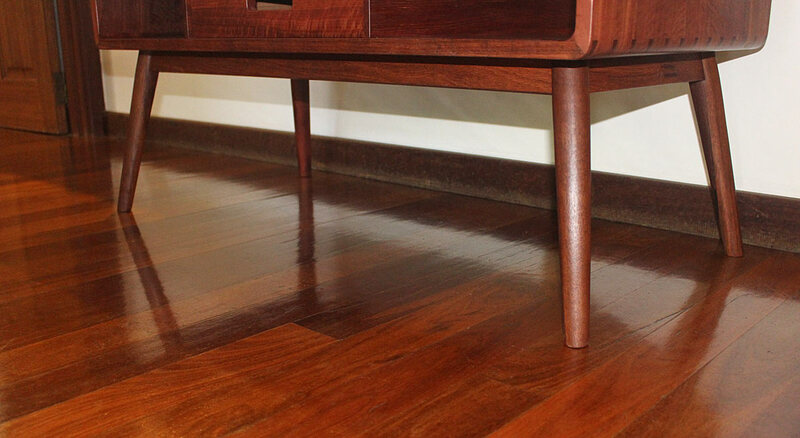 This is a floor finish, and in the examples I saw it looked more like a waxed oil finish. The reports and reviews were highly favourable. I must say, after using it, I was completely sold. It is fantastic! The surfaces were sanded to 400 grit (Abranet), and then two coats were rubbed on with a micromesh cloth, 8 hours apart. Any residue was removed immediately. There was no grain raising that I could detect, however I did rub down the first coats with 400 grit grey mesh. 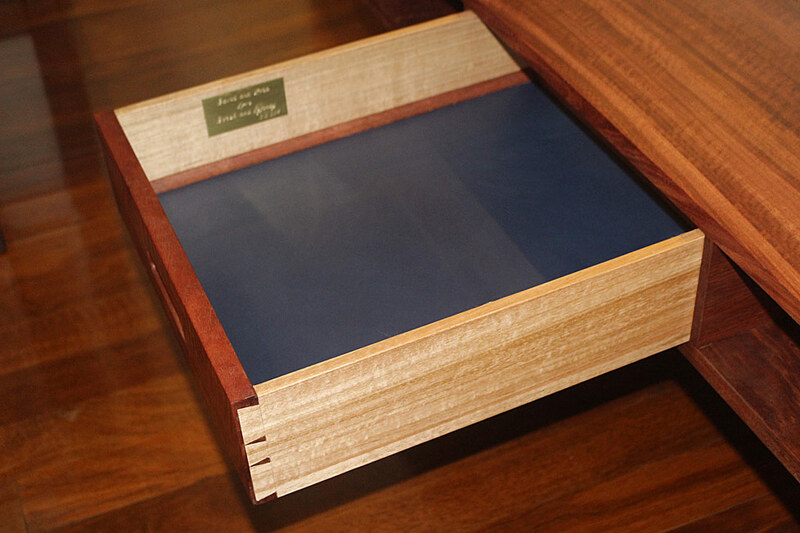 The drawer case was waxed (only) with Lincoln Furniture Wax. This is a shellac-based wax. 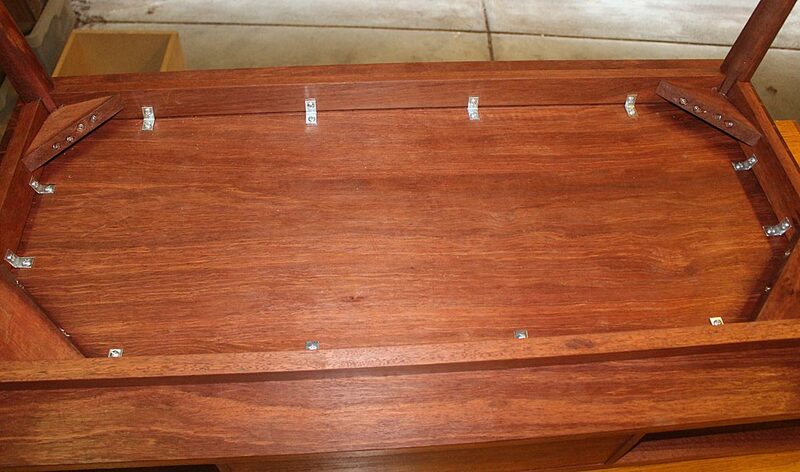 The inside of the drawer was finished with Ubeaut Hard Shellac diluted 50% with methylated spirits (alcohol). All of the above are Australian products. 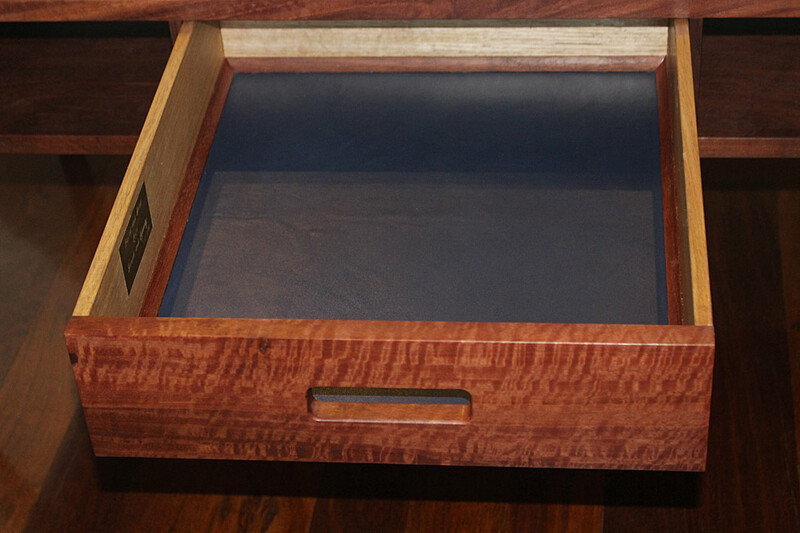 The interior of the drawer was lined in leather, which was waxed with Renaissance Wax. 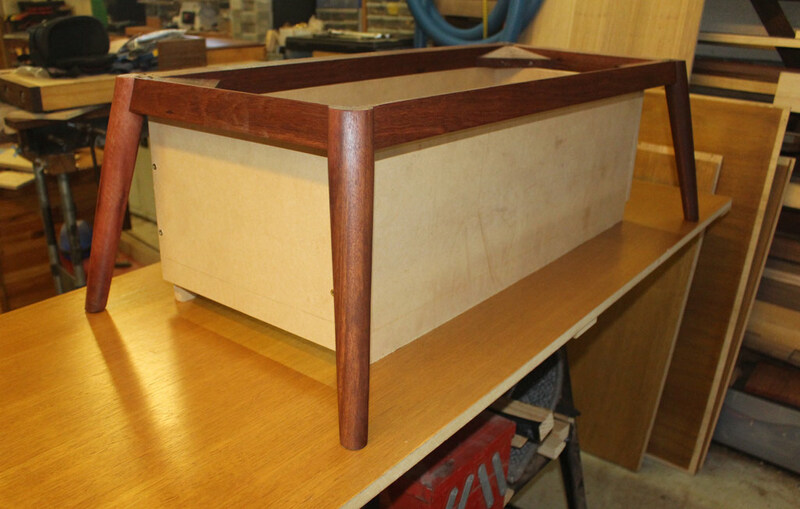 The front, with the drawer (and the agonised-over-drawer-handle-pull-whatever) .. 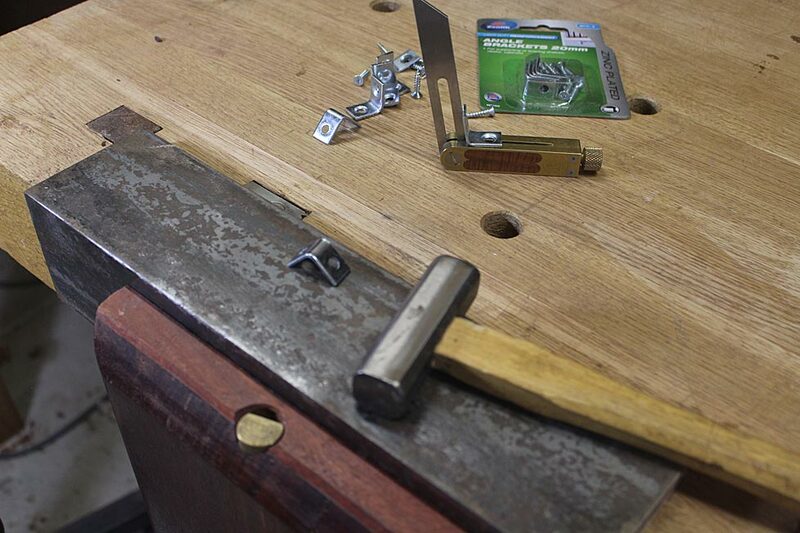 The 10mm drawer sides are Tasmanian Oak, which I find great for this purpose as it all comes quarter sawn. 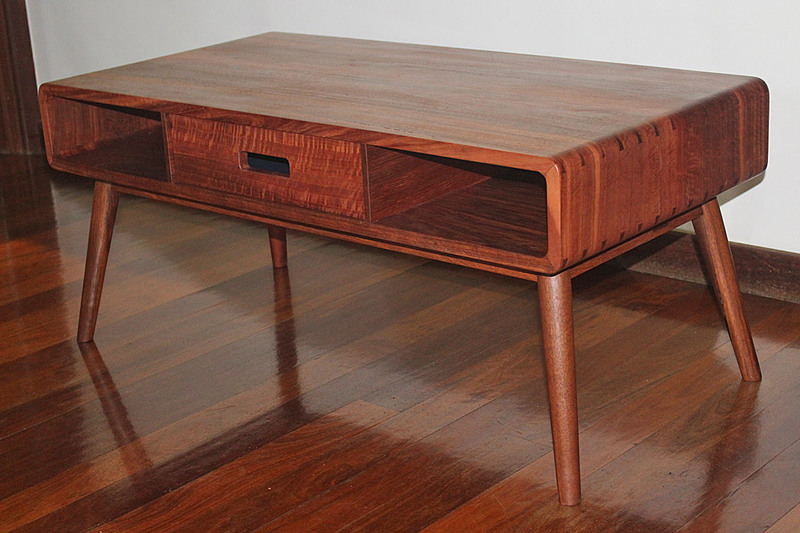 It is a moderately hard wood (by Oz standards). 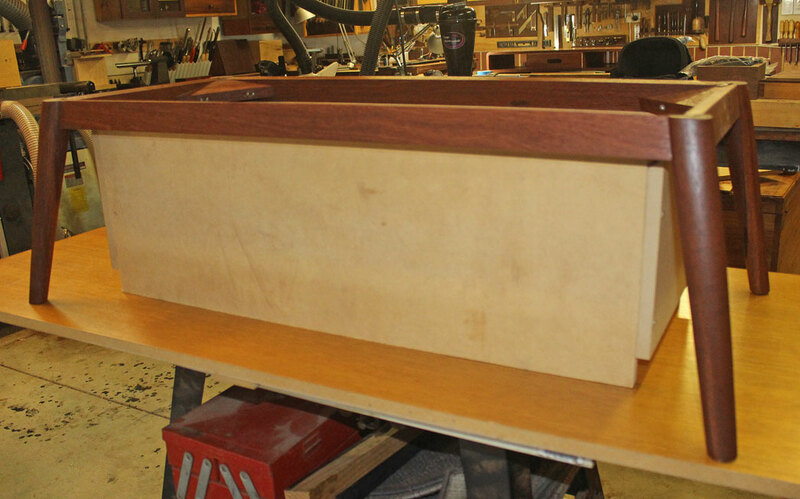 Plywood was used for the drawer bottom, as it was inset in grooves and covered in leather. Jarrah cove moulding was made to finish. Thanks for all the contributions and discussion along the way. Beautiful piece. Thank you for taking us along on the journey. Where do I sign up to be your nephew!? Simply amazing work, Derek! 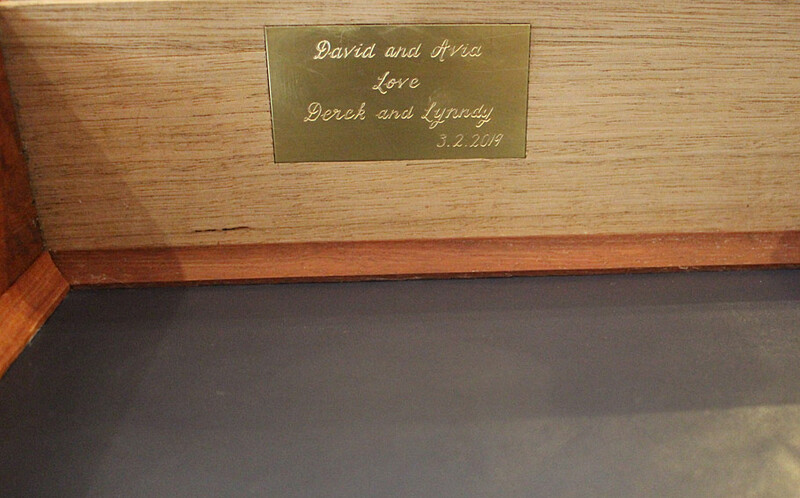 I'm sure the couple will forever cherish it. My deepest thanks for all the kind words to all, especially those who offered opinions since one of the reasons I post to to create discussion. 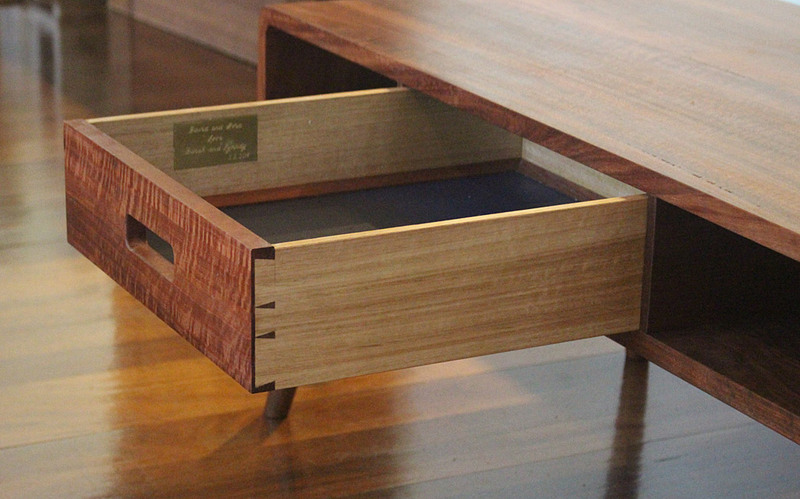 There are just so many ways to do joinery, and so many takes on design. We all benefit from the diversity. This has been an interesting build (they have to be interesting, otherwise why do it?). 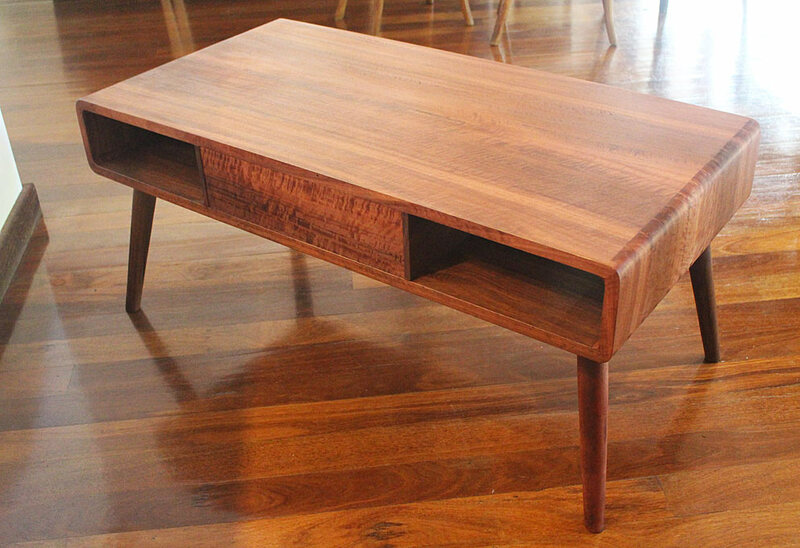 A challenging design to reproduce with hand tools. The first time I had attempted mitred dovetails. That was interesting. It came together very satisfactorily in the end. 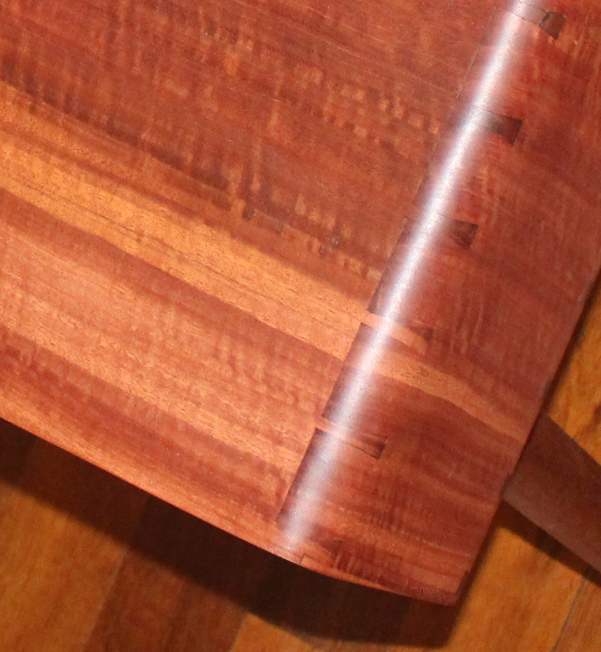 I am in awe of the top - that Jarrah is simply stunning ... far more so in real life where you can see the chatoyance and fiddleback. Honestly...that is absolutely gorgeous. The work that went into it is fantastic. Well done! What a beauty! Derek, hats off!